When a web application receives more requests than it can handle over a short period of time, it can become unresponsive. In the worst case, too many concurrent requests to a web application can cause the software which services the application to crash. This can be a problem for any kind of web-based app, not just those which are served by Zope. The obvious solution to this problem is to use more than one server. When one server becomes overloaded, the others can then hopefully continue to successfully serve requests. By adding additional servers to this kind of configuration, you can “scale” your web application as necessary to meet demand. Using multiple servers has obvious benefits, but it also poses serious challenges. For example, if you have five servers, then you must ensure that all five server installations are populated with the same information. This is not a very hard task if you have only a few static web pages, but for larger applications with large bodies of rapidly changing information, manually synchronizing the data which drives five separate server installations is almost impossible, even with the “out of the box” features that Zope provides. A “stock” Zope installation uses the Zope Object Database as its content store, using a “storage” which is named a “FileStorage”. This storage type (there are others) keeps all of your Zope data in a single file on your computer’s hard drive, typically named Data.fs . This configuration works well until you need to add an additional Zope server to your site to handle increased traffic to your web application. Two Zope servers cannot share this file. The file is “locked” by one Zope server and no other Zope server can access the file. Thus, in a “stock” Zope configuration, it is impossible to add Zope servers which read from the same database in order to “scale” your web application to meet demand. To solve this problem, Zope Corporation has created another kind of “storage”, which operates using a client/server architecture, allowing many Zopes to share the same database information. This product is known as Zope Enterprise Objects or ZEO. ZEO is built into Zope, no additional software install is required. This chapter gives you a brief overview on installing ZEO, but there are many other options we don’t cover. For more in-depth information, see the documentation that comes with the ZEO package, and also take a look at the ZODB and ZEO discussion area. ZEO is a system that allows you to share a Zope Object Database between more than one Zope process. By using ZEO, you may run multiple instances of Zope on a single computer or on multiple computers. Thus, you may spread requests to your web application between Zope servers. You may add more computers as the number of requests grows, allowing your web application to scale. Furthermore, if one Zope server fails or crashes, other servers can still service requests while you fix the broken one. ZEO takes care of making sure each Zope installation uses consistent information from the same Zope Object Database. ZEO uses a client/server architecture. The Zope processes (shown on multiple computers in the diagram below) are the ZEO Clients. All of the clients connect to one, central ZEO Storage Server, as shown in the image below. The terminology may be a bit confusing. Typically, you may think of Zope as a server, not a client. But when using ZEO, your Zope processes act as both servers (for web requests) and clients (for data from the ZEO server). ZEO clients and servers communicate using standard Internet protocols, so they can be in the same room or in different countries. ZEO, in fact, could distribute a Zope site to disparate geographic locations, given good network connectivity between the ZEO clients and the ZEO server. In this chapter we’ll explore some interesting ways you can distribute your ZEO clients. Zope is a high-performance system, and one Zope can handle millions of hits per day, but there are upper bounds on the capacity of a single Zope server. ZEO allows you to scale your site by adding more hardware on which you may place extra Zope servers to handle excess demand. Your site is critical and requires 24/7 uptime. Using ZEO can help you add redundancy to your server configuration. You want to distribute your site to disparate geographic locations in order to increase response time to remote sites. ZEO allows you to place Zope servers which use the same ZODB in separate geographic locations. You want to “debug” an application which is currently served by a single Zope server from another Zope process. ZEO enables the developer to attach to a ZODB database while still continuing to serve requests from another ZEO client. Installing, configuring, and maintaining a ZEO-enabled Zope requires some system administration knowledge. Most Zope users will not need ZEO, or may not have the expertise necessary to maintain a distributed server system like ZEO. ZEO is fun, and can be very useful, but before jumping head-first and installing ZEO in your system you should weigh the extra administrative burden ZEO creates against the simplicity of running just a simple, stand-alone Zope. All of the Zope servers in a ZEO-enabled configuration must run the same version of Zope and ZEO. The easiest way to meet this prerequisite is to make sure all of your computers use the same Zope version. All of your ZEO clients must have the same third party Products installed and they must be the same version. This is necessary, or your third-party objects may behave abnormally or not work at all. If your Zope system requires access to external resources, like mail servers or relational databases, ensure that all of your ZEO clients have access to those resources. Slow or intermittent network connections between clients and server degrade the performance of your ZEO clients. Your ZEO clients should have a good connection to their server. Installing ZEO is very easy. After you have gone through the steps necessary to build the Zope software it takes nothing more than running two scripts and tweaking the default configuration laid down in the ZEO client’s zope.conf configuration file. Make sure you use the same python interpreter that was used to build your Zope software. /path/to/zeostorage represents the location where you want the ZEO server to be. While the script runs you will see output telling you what it is doing. Once you have built the ZEO server’s home this way you will notice that its layout is very similar to a Zope instance home. It has a configuration file named zeo.conf inside its etc-subdirectory which you should look at to get a notion of what can be configured, and you will need it to look up where the server will listen for ZEO requests when you configure your ZEO clients. The ZEO storage home also contains prefabricated start/stop scripts that work the same way as the Zope zopectl script, for ZEO it is called zeoctl . or by looking at the log file directly. Its location is configurable using the previously mentioned zeo.conf configuration file. directive. If you have not tweaked your zeo.conf file all you need to do at this moment is to ensure that the server argument in the zeoclient directive shows the same value as the address argument in the zeo directive inside your ZEO server’s zeo.conf-file. Now visit the Zope Managment Interface (ZMI) of your ZEO client in a web browser and go to the Control Panel. Click on Database Managment. Here, you see that Zope is connected to a ZEO Storage and that its state is connected. Running ZEO on one computer is a great way to familiarize yourself with ZEO and how it works. Running a single ZEO client does not however, improve the speed of your site, and in fact, it may slow it down just a little. To really get the speed benefits that ZEO provides, you need to run multiple ZEO clients. This can easily be achieved by creating more ZEO client instances as described above. The instances can be on the same server machine or distributed over several machines. Imagine you have a ZEO server named zooServer and three ZEO clients named zeoclient1, zeoclient2, and zeoclient3. The three ZEO clients are connected to the ZEO server and each client is verified to work properly. Now you have three computers that serve content to your users. The next problem is how to actually spread the incoming web requests evenly among the three ZEO clients. Your users only know about www.zopezoo.org, not zeoclient1, zeoclient2 or zeoclient3. It would be a hassle to tell only some users to use zeoclient1, and others to use zeoclient3, and it wouldn’t be very good use of your computing resources. You want to automate, or at least make very easy, the process of evenly distributing requests to your various ZEO clients. There are a number of solutions to this problem, some easy, some advanced, and some expensive. The next section goes over the more common ways of spreading web requests around various computers using different kinds of technology, some of them based on freely-available or commercial software, and some of them based on special hardware. The easiest way to distribute requests across many web servers is to pick from a list of mirrored sites, each of which is a ZEO client. Using this method requires no extra software or hardware, it just requires the maintenance of a list of mirror servers. By presenting your users with a menu of mirrors, they can use to choose which server to use. Note that this method of distributing requests is passive (you have no active control over which clients are used) and voluntary (your users need to make a voluntary choice to use another ZEO client). If your users do not use a mirror, then the requests will go to your ZEO client that serves www.zopezoo.org. If you do not have any administrative control over your mirrors, then this can be a pretty easy solution. If your mirrors go off-line, your users can always choose to come back to the master site which you do have administrative control over and choose a different mirror. On a global level, this method improves performance. Your users can choose to use a server that is geographically closer to them, which probably results in faster access. For example, if your main server was in Portland, Oregon on the west coast of the USA and you had users in London, England, they could choose your London mirror and their request would not have to go half-way across the world and back. To use this method, create a property in your root folder of type lines named “mirror”. On each line of this property, put the URL to your various ZEO clients, as shown in the figure below. print "<h2>Please choose from the following mirrors: <ul>"
This TAL code (and Script (Python) equivalent) displays a list of all mirrors your users can choose from. When using this model, it is good to name your computers in ways that assist your users in their choice of mirror. For example, if you spread the load geographically, then choose names of countries for your computer names. This code will redirect any visitors to www.zopezoo.org to a random mirror server. 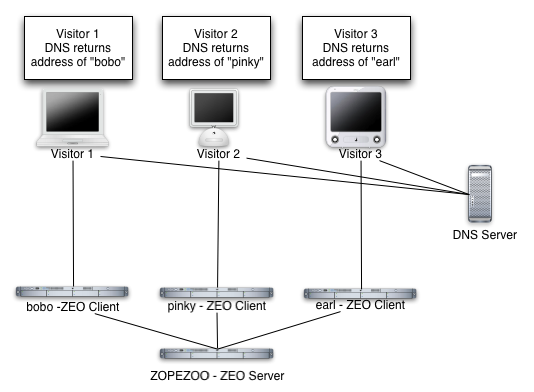 The Domain Name System, or DNS, is the Internet mechanism that translates computer names (like “www.zope.org”) into numeric addresses. This mechanism can map one name to many addresses. 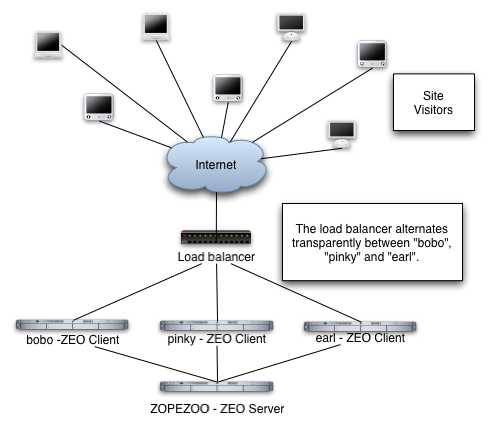 The simplest method for load-balancing is to use round-robin DNS, as illustrated in the figure below. When www.zopezoo.org gets resolved, DNS answers with the address of either zeoclient1, zeoclient2, or zeoclient3 - but in a rotated order every time. For example, one user may resolve www.zopezoo.org and get the address for zeoclient1, and another user may resolve www.zopezoo.org and get the address for zeoclient2. This way your users are spread over the various ZEO clients. This not a perfect load balancing scheme, because DNS information gets cached by the other nameservers on the Internet. Once a user has resolved www.zopezoo.org to a particular ZEO client, all subsequent requests for that user also go to the same ZEO client. The final result is generally acceptable, because the total sum of the requests are really spread over your various ZEO clients. One potential problem with this solution is that it can take hours or days for name servers to refresh their cached copy of what they think the address of www.zopezoo.org is. If you are not responsible for the maintenance of your ZEO clients and one fails, then 1/Nth of your users (where N is the number of ZEO clients) will not be able to reach your site until their name server cache refreshes. Configuring your DNS server to do round-robin name resolution is an advanced technique that is not covered in this book. A good reference on how to do this can be found in the Apache Documentation. Distributing the load with round-robin DNS is useful, and cheap, but not 100% effective. DNS servers can have strange caching policies, and you are relying on a particular quirk in the way DNS works to distribute the load. The next section describes a more complex, but much more powerful way of distributing load called Layer 4 Switching. Layer 4 switching lets one computer transparently hand requests to a farm of computers. This is an advanced technique that is largely beyond the scope of this book, but it is worth pointing out several products that do Layer 4 switching for you. Layer 4 switching involves a switch that, according to your preferences, chooses from a group of ZEO clients whenever a request comes in, as shown in the figure below. There are hardware and software Layer 4 switches. There are a number of software solutions, but one in general that stands out is the Linux Virtual Server (LVS). This is an extension to the free Linux operating system that lets you turn a Linux computer into a Layer 4 switch. More information on the LVS can be found on its website. There are also a number of hardware solutions that claim higher performance than software based solutions like LVS. Cisco Systems has a hardware router called LocalDirector that works as a Layer 4 switch, and Alteon also makes a popular Layer 4 switch. If you are looking for a simple load balancer and proxy software to put in front of your ZEO clients you can take a look at the Pound load balancer which can be set up quickly and offers many convenient features. Many administrators will want to cache content and load balance at the same time. The Squid cache server is an excellent choice. Toby Dickenson has written up a HowTo describing a configuration in which Squid caches and balances the load among several ZEO clients. Without ZEO, a single Zope system is a single point of failure. ZEO allows you to spread that point of failure around to many different computers. If one of your ZEO clients fails, other clients can answer requests on the failed clients behalf. However, in a typical ZEO setup there is still a single point of failure: the ZEO server itself. Without using commercial software, this single point of failure cannot be removed. One popular method is to accept the single point of failure risk and mitigate that risk as much as possible by using very high-end, reliable equipment for your ZEO server, frequently backing up your data, and using inexpensive, off-the-shelf hardware for your ZEO clients. By investing the bulk of your infrastructure budget on making your ZEO server rock solid (redundant power supplies, RAID, and other fail-safe methods) you can be pretty well assured that your ZEO server will remain up, even if a handful of your inexpensive ZEO clients fail. Some applications, however, require absolute one-hundred-percent uptime. There is still a chance, with the solution described above, that your ZEO server will fail. If this happens, you want a backup ZEO server to jump in and take over for the failed server right away. Like Layer 4 switching, there are a number of products, software and hardware, that may help you to create a backup storage server. One popular software solution for linux is called fake. Fake is a Linux-based utility that can make a backup computer take over for a failed primary computer by “faking out” network addresses. When used in conjunction with monitoring utilities like mon or heartbeat, fake can guarantee almost 100% up-time of your ZEO server and Layer 4 switches. Using fake in this way is beyond the scope of this book. ZEO also has a commercial “multiple-server” configuration which provides for redundancy at the storage level. Zope Corporation sells a commercial product named Zope Replication Services that provides redundancy in storage server services. It allows a “secondary” storage server to take over for a “primary” server when the primary fails. The final piece of the puzzle is where the ZEO server stores its information. If your primary ZEO server fails, how can your backup ZEO server ensure it has the most recent information that was contained in the primary server? Before explaining the details of how the ZEO server works, it is worth understanding some details about how Zope storages work in general. Zope does not save any of its object or information directly to disk. Instead, Zope uses a storage component that takes care of all the details of where objects should be saved. This is a very flexible model, because Zope no longer needs to be concerned about opening files, or reading and writing from databases, or sending data across a network (in the case of ZEO). Each particular storage takes care of that task on Zope’s behalf. For example, a plain, stand-alone Zope system can be illustrated in the figure below. You can see there is one Zope application which plugs into a FileStorage. This storage, as its name implies, saves all of its information to a file on the computer’s filesystem. 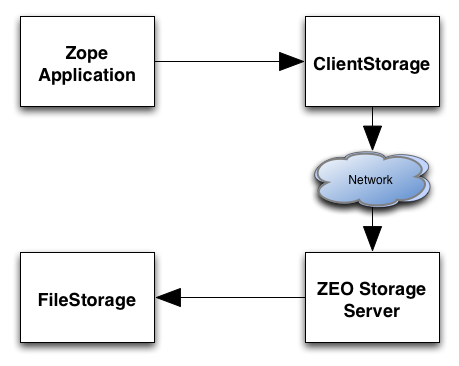 When using ZEO, you simple replace the FileStorage with a ClientStorage, as illustrated in the figure below. Instead of saving objects to a file, a ClientStorage sends objects over a network connection to a Storage Server. As you can see in the illustration, the Storage Server uses a FileStorage to save that information to a file on the ZEO server’s filesystem. In a “stock” ZEO setup, this storage file is in the same place as it would be were you not running ZEO (within your Zope directory’s var directory named Data.fs ). A ZEO server does not need much in terms of care and feeding. You need to make sure the ZODB does not grow too large and pack it once in a while, and you should rotate the server logs. FileStorage, the most common ZODB database format, works by appending changes at the file end. That means it will grow with time. To avoid running out of space it can be packed, a process that will remove old object revisions and shrink the ZODB. Zope comes with a handy utility script to do this task, and you can run it in an automated fashion like out of cron . Look for a script named zeopack.py underneath ZODBTools in the utilities directory of your Zope installation. Make sure you use the same version of Python that is used to run the ZEO server. ZEO by default keeps a single event log. It is located in the log subdirectory of your ZEO server’s home and can be configured using the zeo.conf configuration file. Depending on the level of logging specified and server traffic the file can grow quite quickly. For the most part, running ZEO is exactly like running Zope by itself, but there are a few issues to keep in mind. First, it takes longer for information to be written to the Zope object database. This does not slow down your ability to use Zope (because Zope does not block you during this write operation) but it does increase your chances of getting a ConflictError. Conflict errors happen when two ZEO clients try to write to the same object at the same time. One of the ZEO clients wins the conflict and continues on normally. The other ZEO client loses the conflict and has to try again. Conflict errors should be as infrequent as possible because they could slow down your system. While it’s normal to have a few conflict errors (due to the concurrent nature of Zope) it is abnormal to have many conflict errors. The pathological case is when more than one ZEO client tries to write to the same object over and over again very quickly. In this case, there will be lots of conflict errors, and therefore lots of retries. If a ZEO client tries to write to the database three times and gets three conflict errors in a row, then the request is aborted and the data is not written. Because ZEO takes longer to write this information, the chances of getting a ConflictError are higher than if you are not running ZEO. Because of this, ZEO is more write sensitive than running Zope without ZEO. You may have to keep this in mind when you are designing your network or application. As a rule of thumb, more and more frequent writes to the database increase your chances of getting a ConflictError. However, faster and more reliable network connections and computers lower your chances of getting a ConflictError. By taking these two factors into account, conflict errors can be mostly avoided. ZEO servers do not have any in-memory cache for frequently or recently accessed items. Every request for an object from a ZEO client will cause a read from disk. While some of that read activity is served by operating system level disk caches or hardware caches built into the drive itself it can still make the server quite busy if multiple ZEO clients are in use. It is good practice to ensure that a busy ZEO server has a fast disk. To maximize serving speed for ZEO clients (which necessitates minimizing trips to the ZEO server for retrieving content) it is advisable to keep a large ZEO client cache. This cache keeps frequently accessed objects in memory on the ZEO client. The cache size is set inside the zeoclient stanza in the zodb_db main section of your ZEO client’s zope.conf file. Using the key cache-size you can specify an integer value for the number of bytes used as the ZEO cache. By default this is set to a value of 20000000, which equates about 20 MB. Zope allows you to use a simpler format such as 256MB for the cache-size key. In this chapter we looked at ZEO, and how ZEO can substantially increase the capacity of your website. In addition to running ZEO on one computer to get familiarized, we looked at running ZEO on many computers, and various techniques for spreading the load of your visitors among those many computers. ZEO is not a “magic bullet” solution, and like other system designed to work with many computers, it adds another level of complexity to your website. This complexity pays off however when you need to serve up lots of dynamic content to your audience. © Copyright 2009-2019, The Zope developer community Revision a8208a7d.